Work the six-pointed Jewish Star of David in needlepoint in four complementary colors and turn it into a Yamulke or Kippah for someone special to wear on Jewish Holidays and to Temple services. Get the free pattern and project instructions for easy stitching that only takes a week to 10 days to complete. 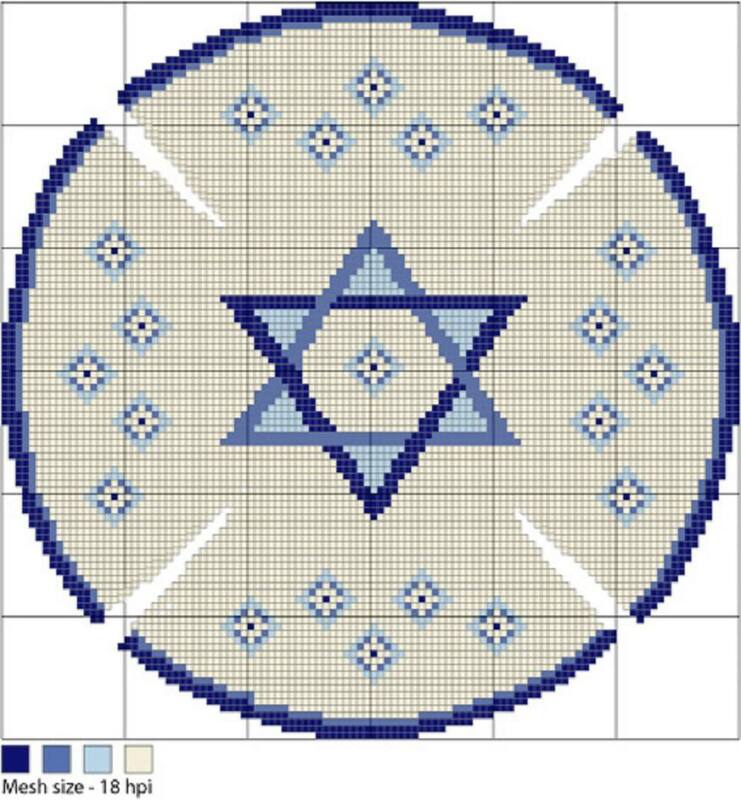 Designed by Cheryl Fall, this Judaic Magen David Judaica needlepoint design is best worked on #18 mesh needlepoint canvas for a finished design size that’s 6-1/4 inch in diameter. Take a look at what you will need to make your own Star of David Needlepoint Kippah. 18-Mesh Needlepoint Canvas - one piece of good quality 100% cotton mono canvas that is at least 2 to 3 inches larger on all sides than the finished design size. Since this design is round, and the canvas piece is square or rectangular, you will want to cut a piece that is large enough for stitching as well as for final finishing (about 10-square inches). DMC #5 Perle Cotton: The pattern calls for 3 skeins of white, 1 skein each of light, medium and dark blue; however, you may change the colors to suit personal taste. If desired, mix silver or metallic blending filaments with the thread. NOTE: You may also use Persian Wool Thread to stitch the Kippah design; but make sure it is worked on cotton canvas instead of linen to avoid breaking the law of Shatnez. #22 Tapestry Needles - Make sure you have on hand two or more needles in this size--at least one for each color--to cut down on the amount of re-threading you will need to do from constant color changes. The elongated needle eye and blunt tip makes it easier for both the needle as well as the thread to slide through the canvas holes without pulling the surrounding meshes apart. General Needlepoint Tools & Supplies - For best results, you should mount the needlepoint canvas on stretcher bars with brass tacks instead of staples before stitching. Although this is optional, it will reduce the amount of blocking and stretching required during the finishing process--especially if working with tent stitches. Other items needed are sharp embroidery scissors, regular stitching supplies, ample light and magnification, if needed. Project Bag - Choose a large enough bag (either plastic or fabric) to hold the framed design as well as threads and needlepoint supplies. It will help to keep the canvas neat and clean and protect your needlepoint from snags and dust. Download the free pattern from this link. Enlarge the needlepoint chart to see the stitches or use magnification as you stitch. One square of the chart is equal to one needlepoint stitch, which consists of one vertical and horizontal intersection of canvas mesh threads. Work the Kippah in tent needlepoint stitches. Continental stitch works well because it provides great coverage on the wrong side of the canvas; however, if you prefer, Basketweave Tent Stitch can also be used. The finished needlepoint Kippah contains over 10,000 individual stitches! ​The needlepoint Kippah is sturdy enough to wear unlined; but you can also use the trimmed finished needlepoint canvas as a template for cutting matching lining fabric and sewing it to the completed needlepoint for a more professional look. Finish the needlepoint project by stitching the darts (see the chart) by hand with white cotton thread. Trim the canvas to within 1.4 inches of the stitching. Clip the curves and turn the canvas edges to the inside (wrong side) of the Kippah. If desired, add a decorative corded trim around the edges. Optional: Turn edges of lining fabric to the wrong side and press. Sew lining to the needlepoint Kippah by hand. ​The Kippah is now ready for gifting and wearing.